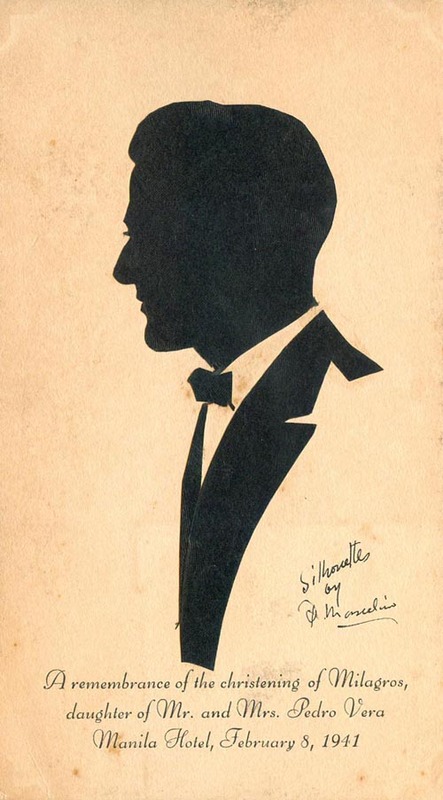 The name "silhouette" was derived from an unpopular character named Etienne de Silhouette, the controller general of France in 1757 and a regular shadow cutter himself. Since then, the term was applied to anything cheap or makeshift, though the art of shadow cutting had preceded this character by hundreds of years on the European continent. 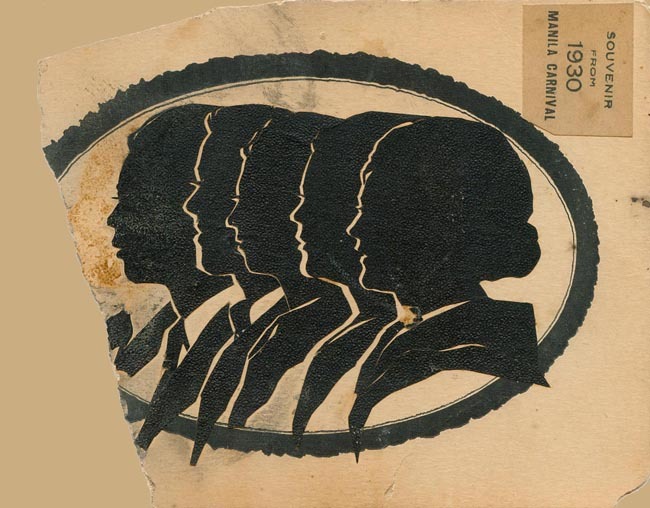 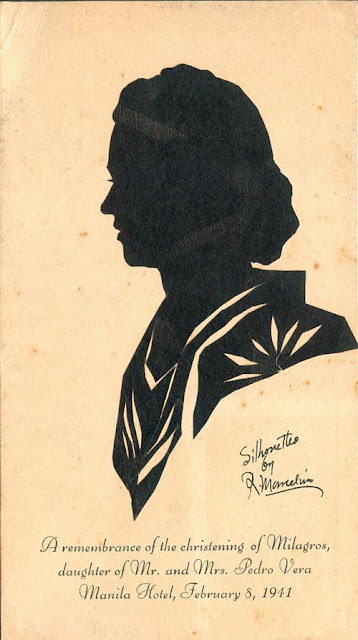 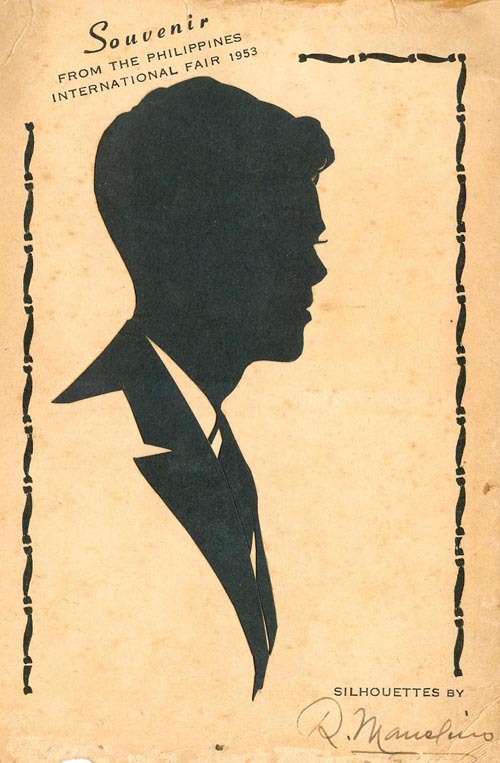 Producing silhouettes has been an inexpensive means of obtaining a portrait since the materials required are readily available. 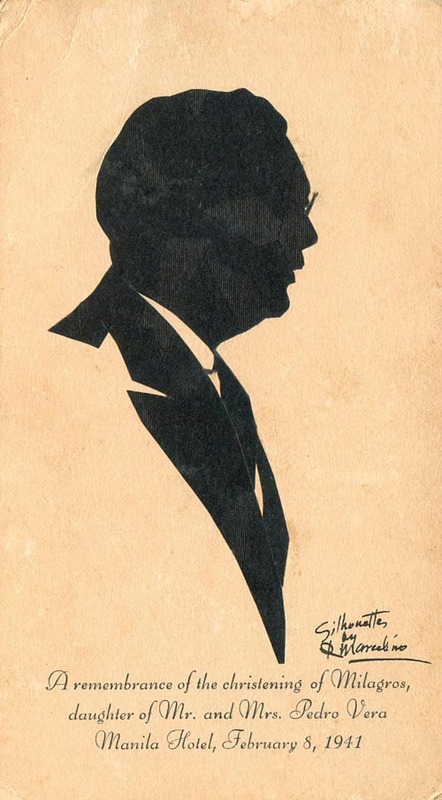 Miniature profiles are cut out of black paper and mounted on white backgrounds, or cut from white paper and the hollow mounted on dark cloth or black paper. The coming of the Americans at the turn of the 20th century in the country began the commercial fad and promotion of the silhouette. 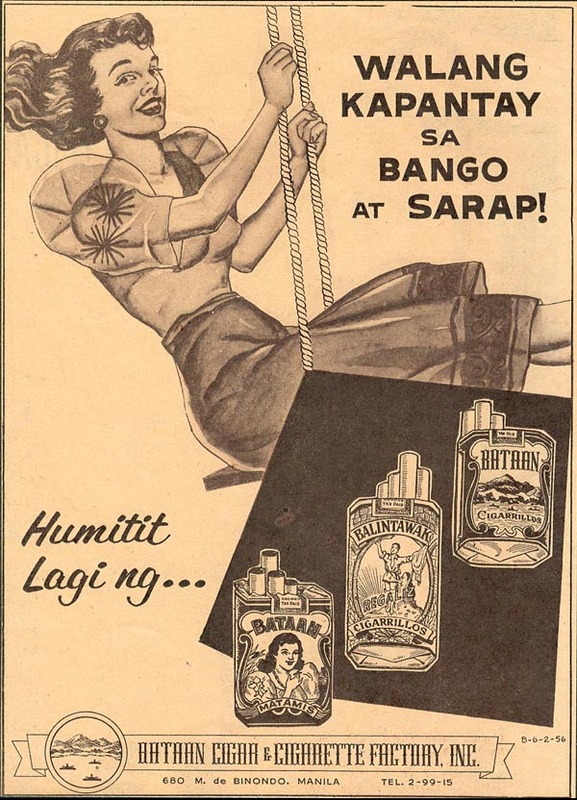 Despite the initial fascination of Filipino consumer-s, there were very few local artists who took the cudgels of specializing in this type of folk art. 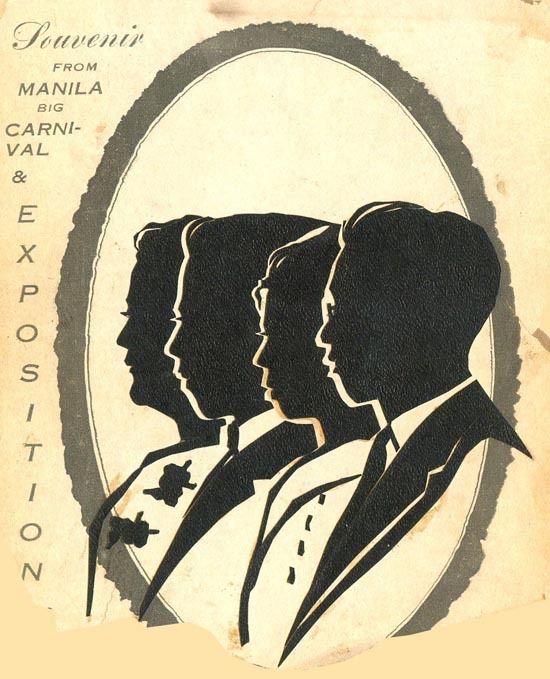 Some examples of the product as shown below were produced by R. Marcelino at the Manila Carnival grounds since the 1920s until the 1953 International Fair. 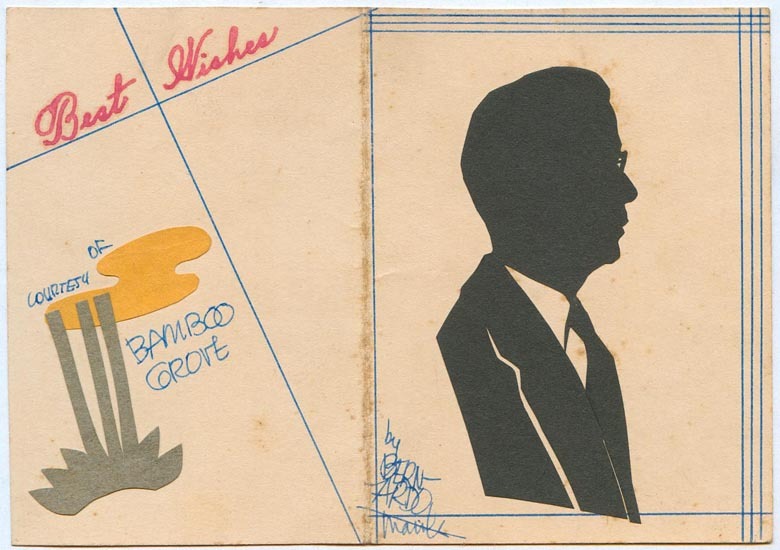 And another artist named Bernardo practiced his trade at a certain place called Bamboo Grove. 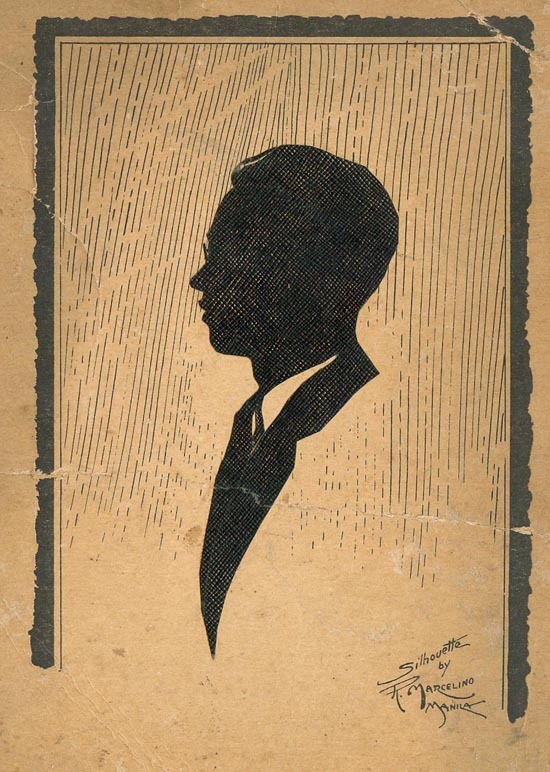 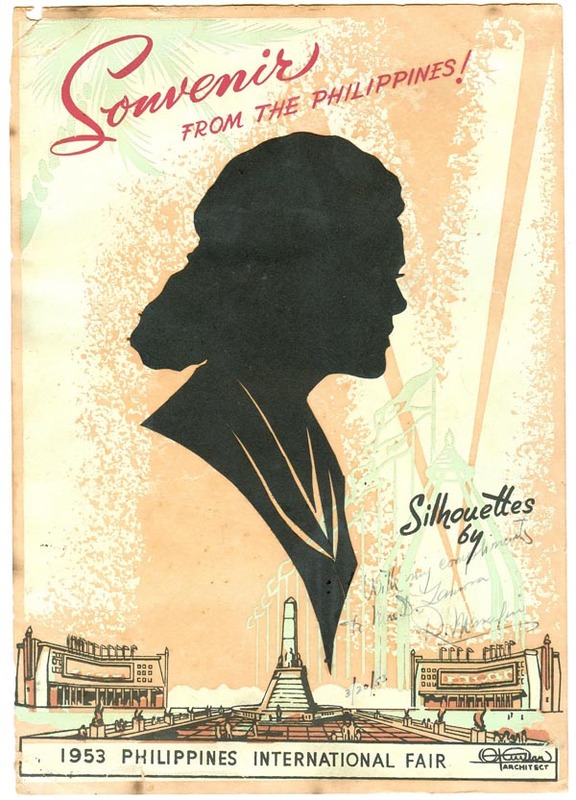 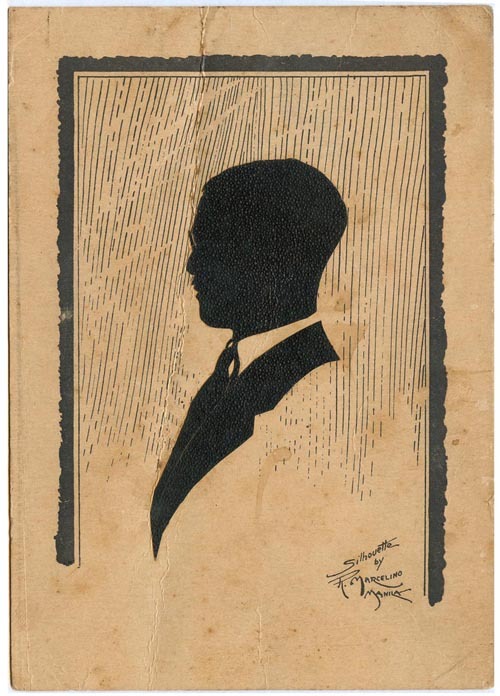 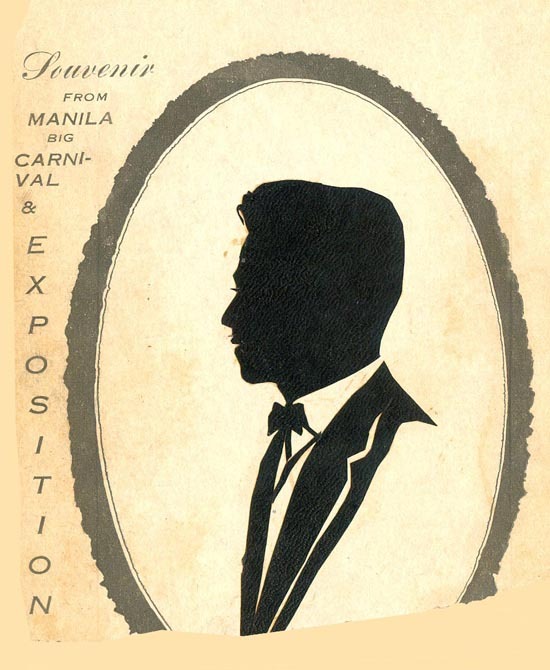 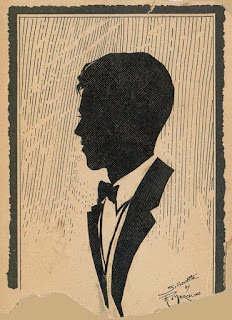 Silhouette Souvenir from the 1930 Manila Carnival. 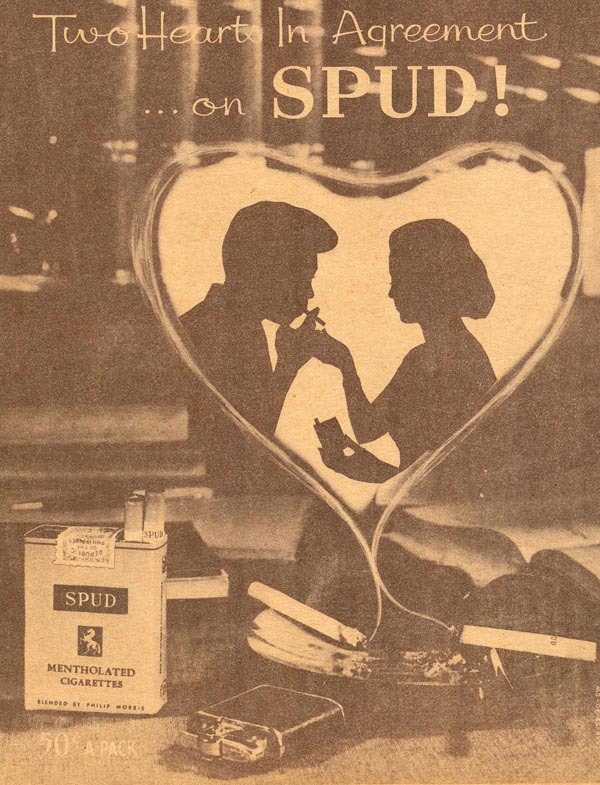 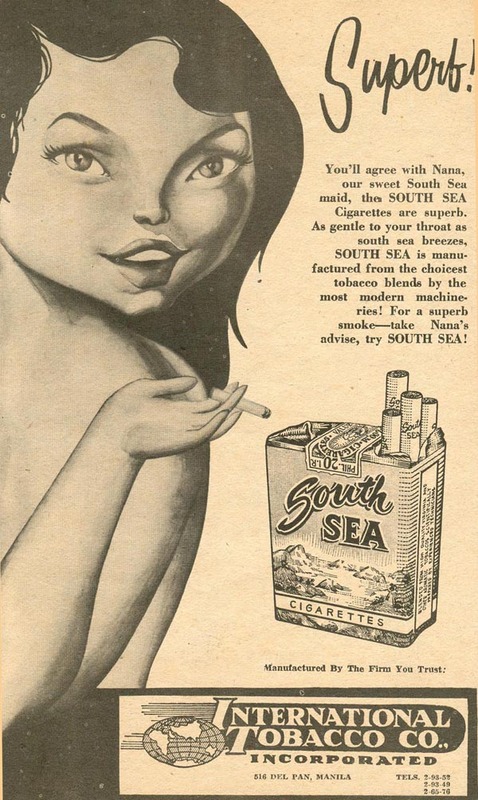 The worlds of advertising and cigarette smoking have been intertwined for as long as we can remember. 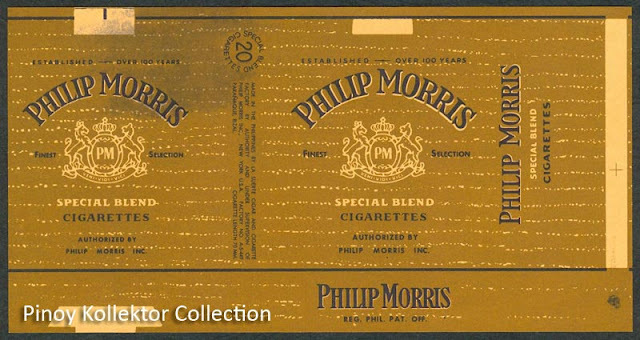 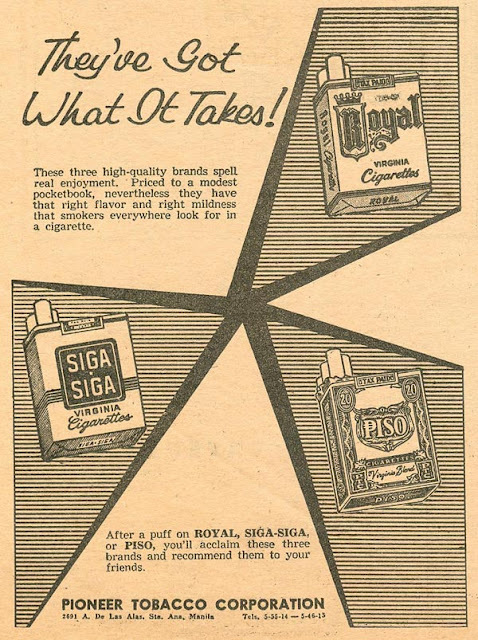 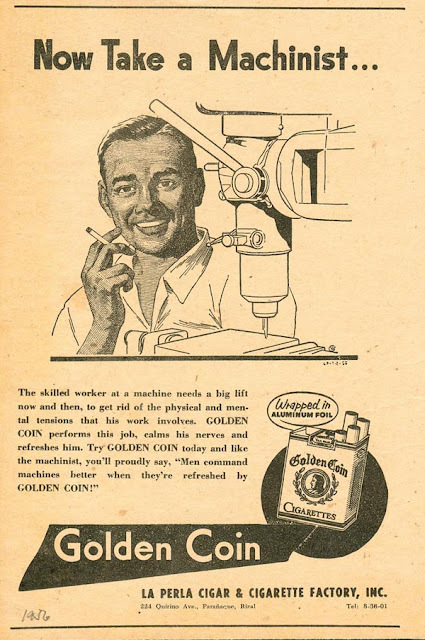 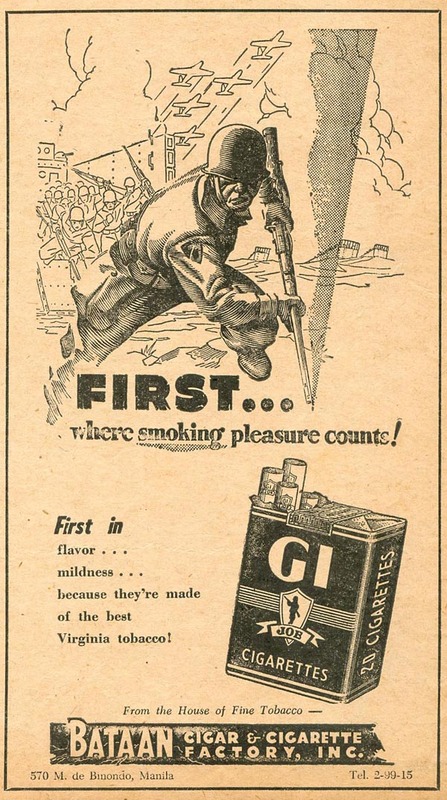 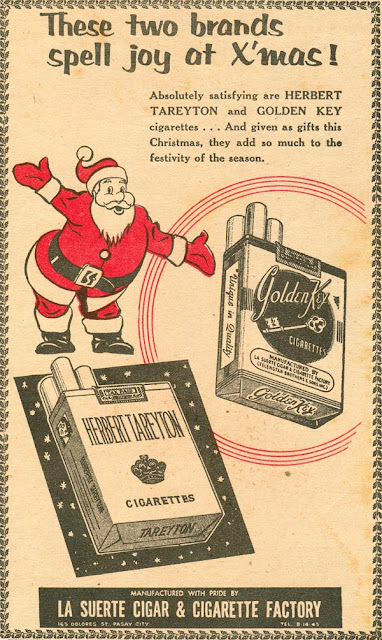 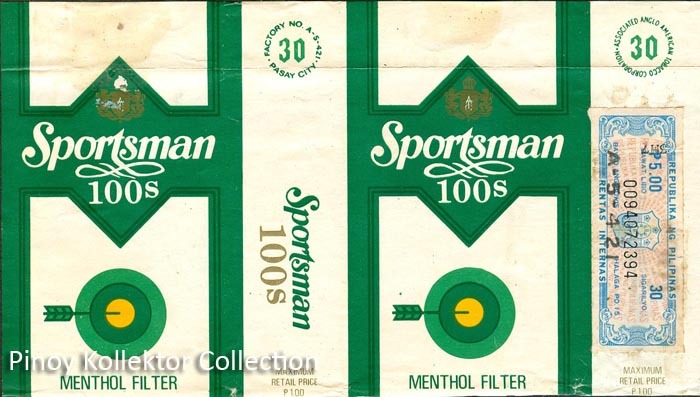 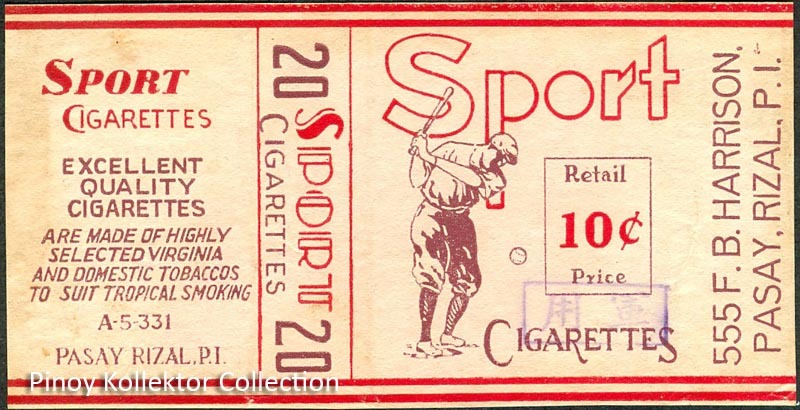 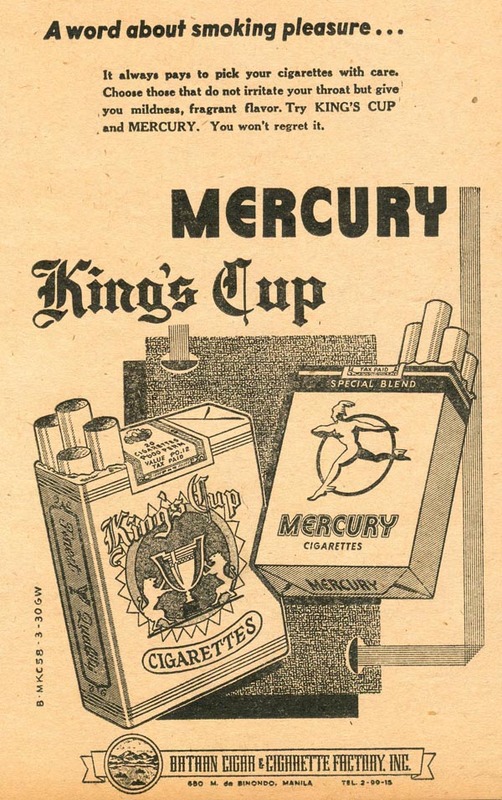 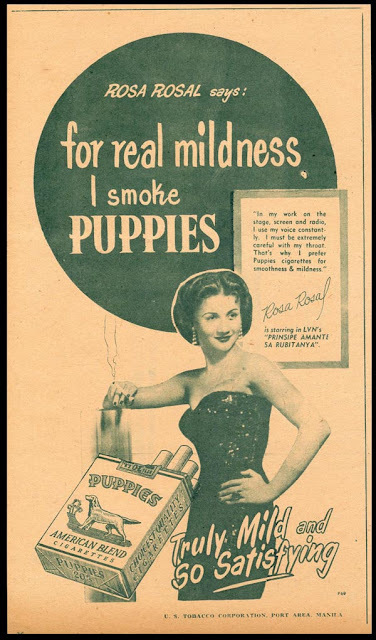 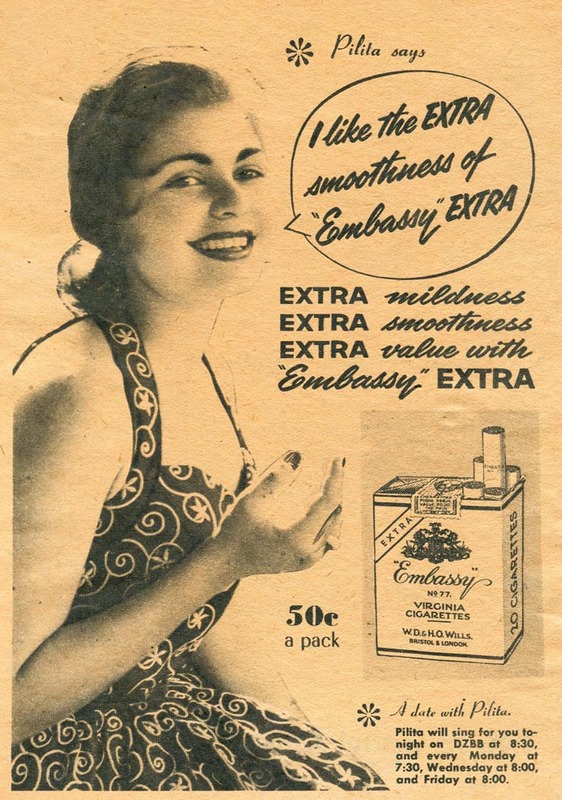 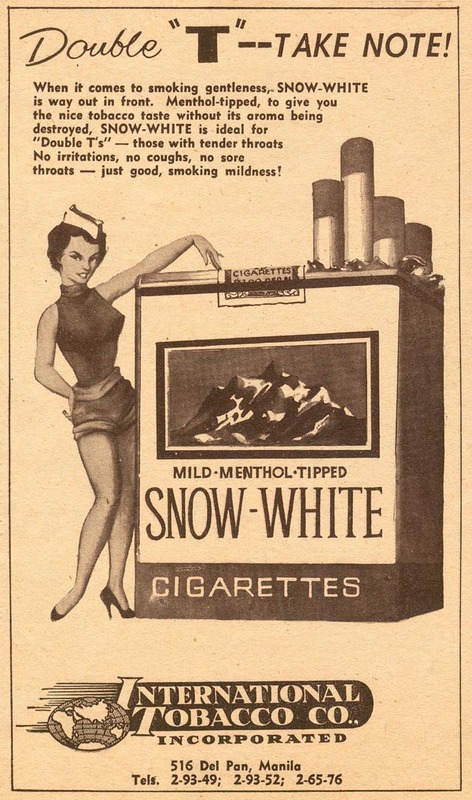 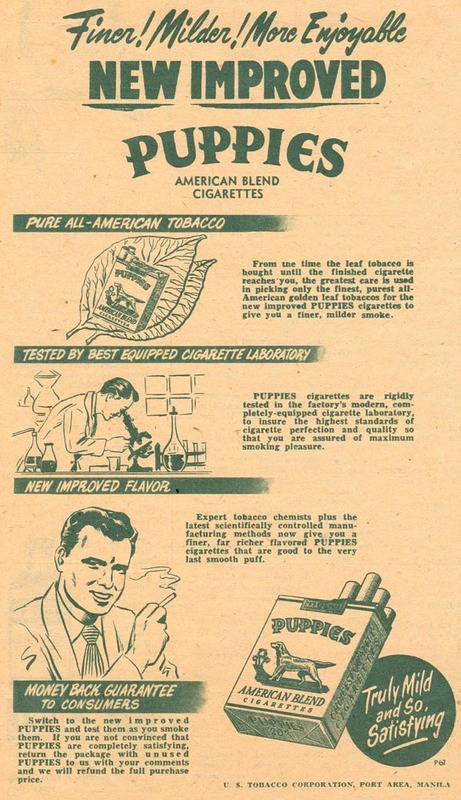 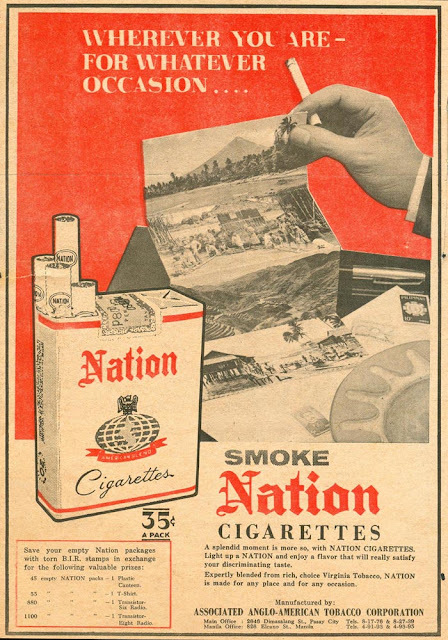 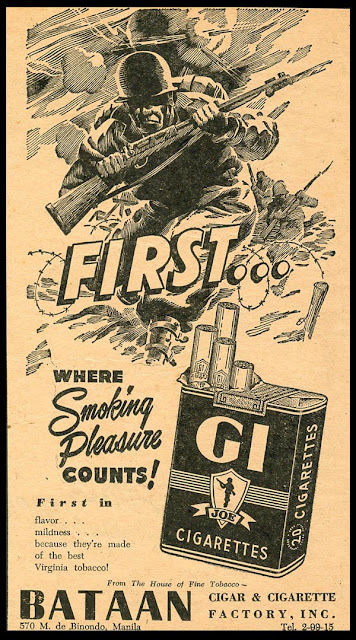 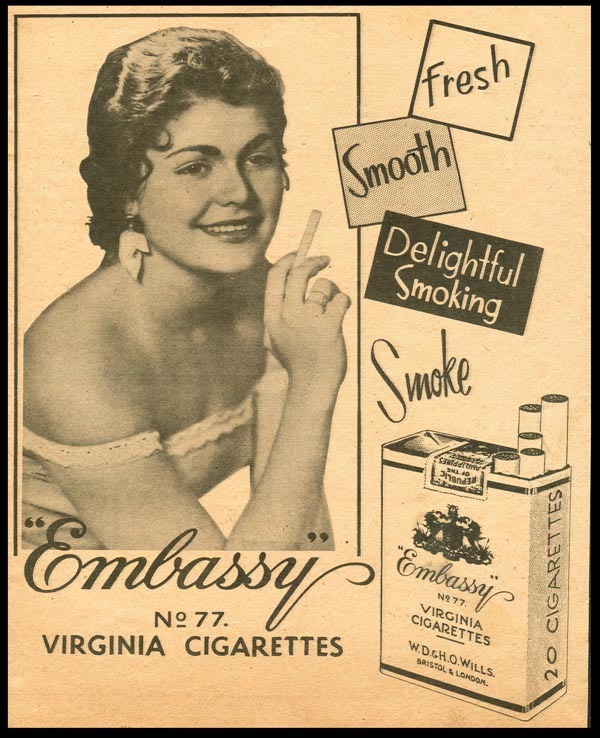 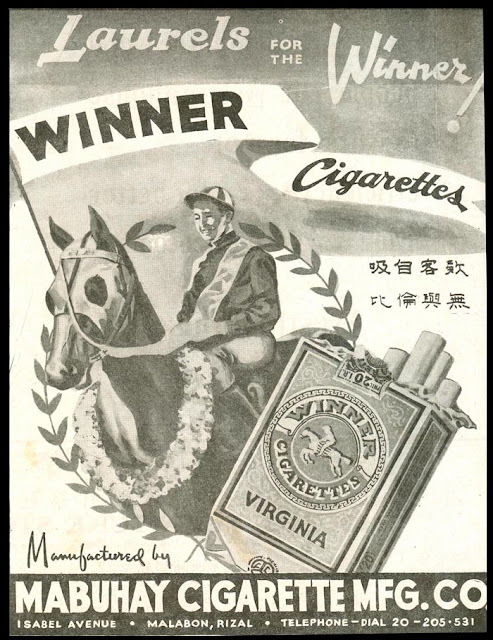 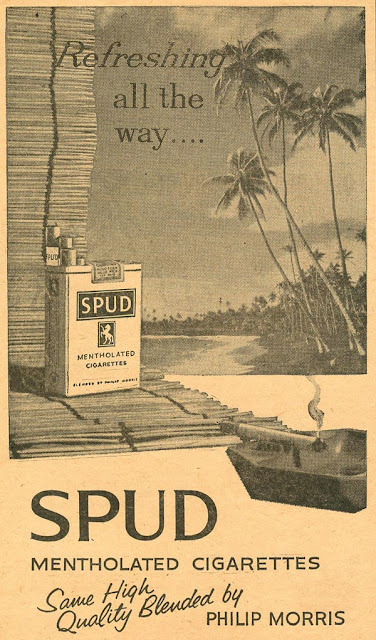 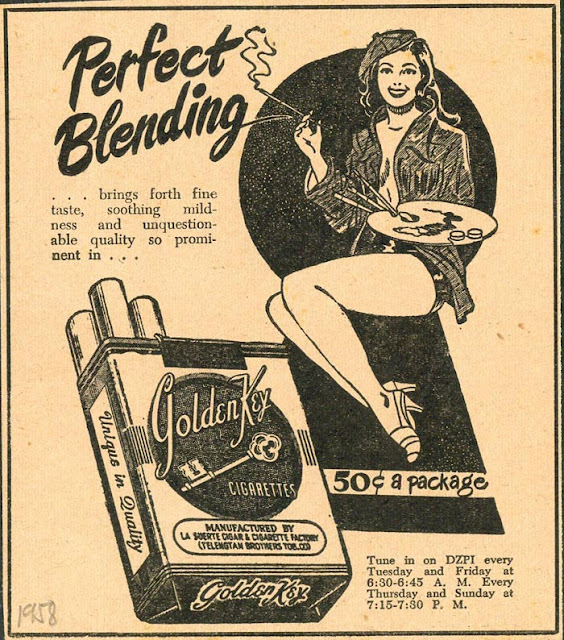 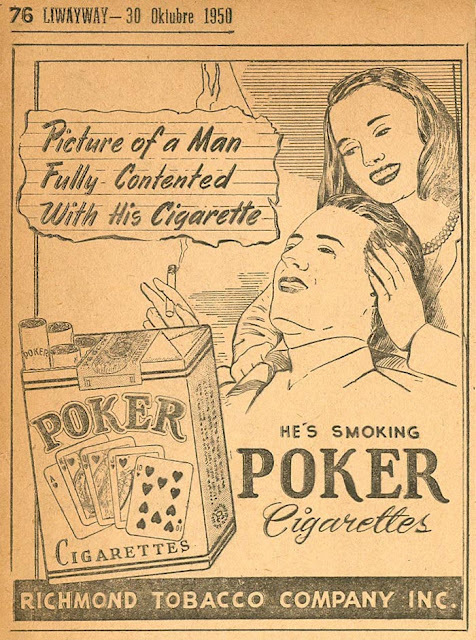 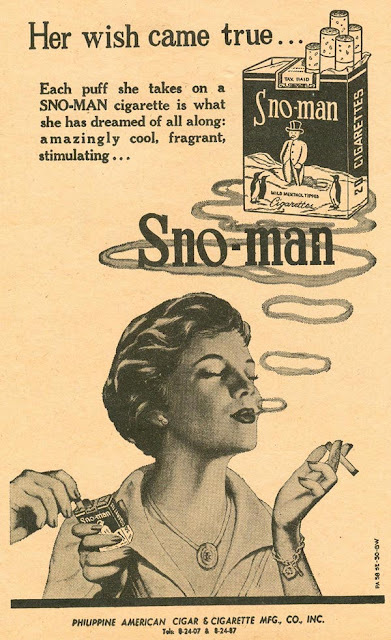 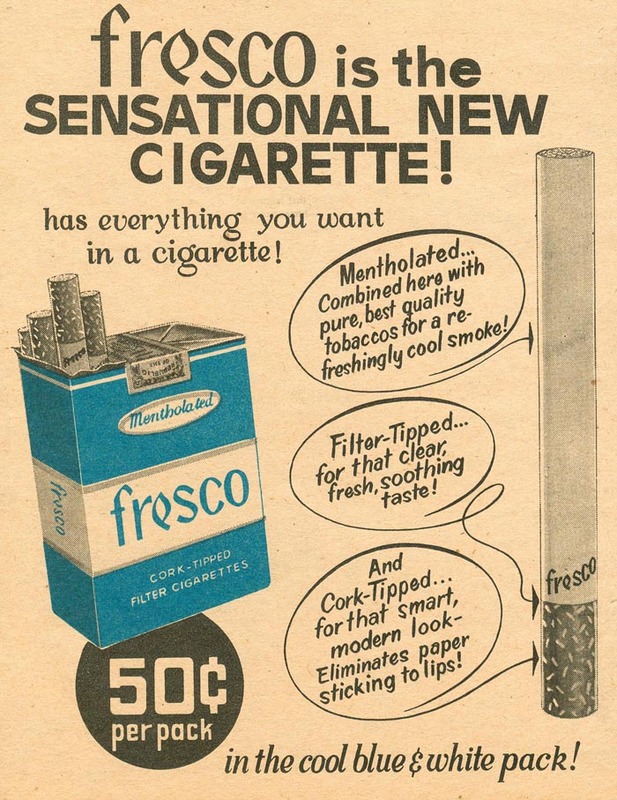 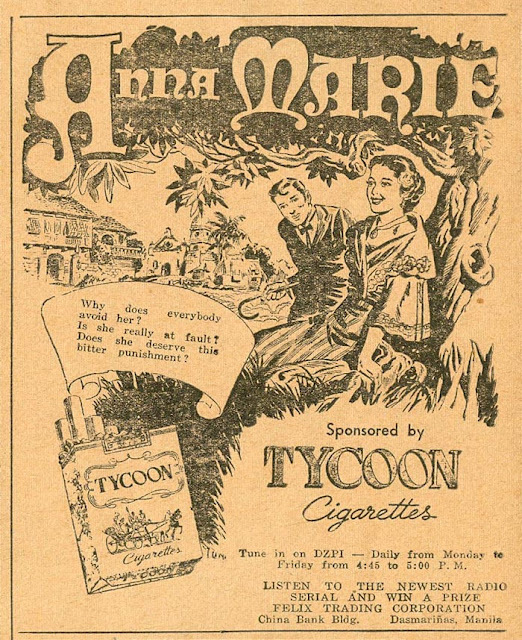 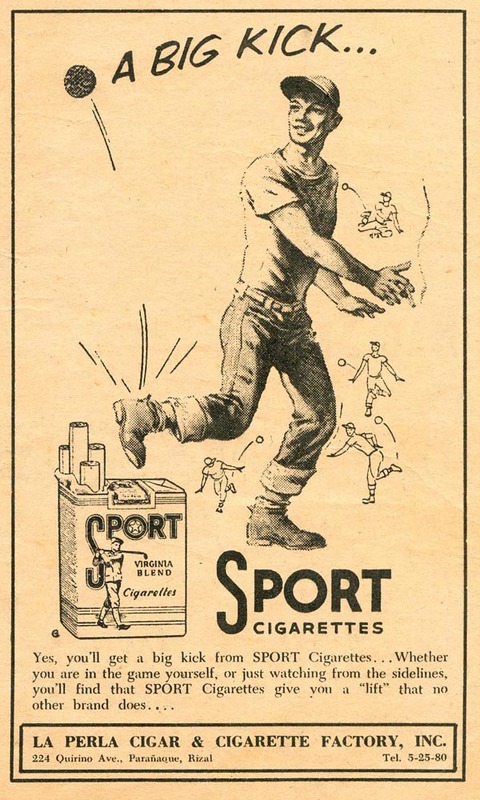 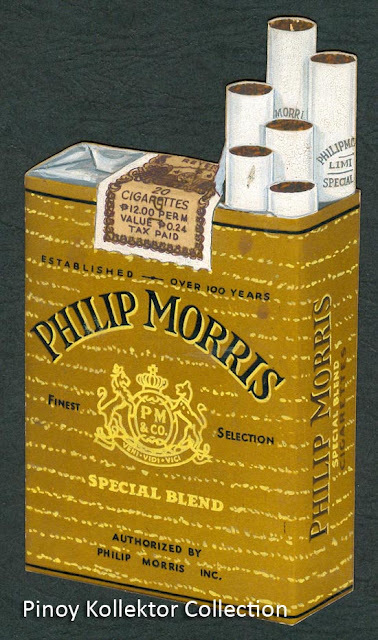 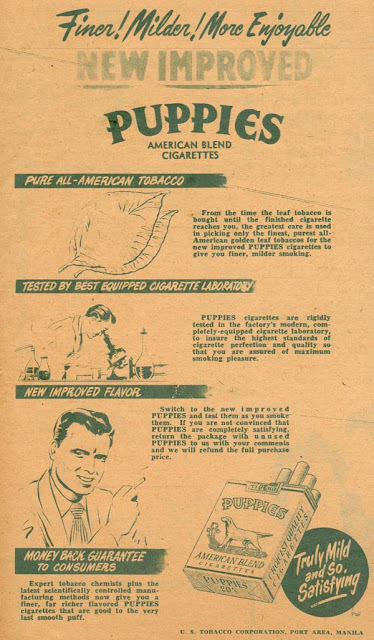 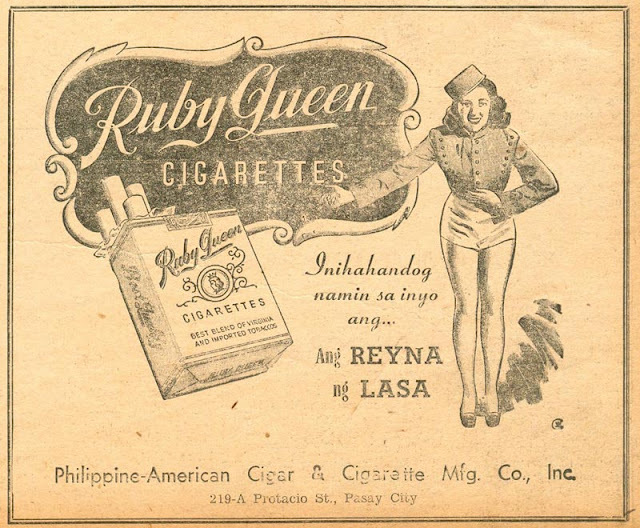 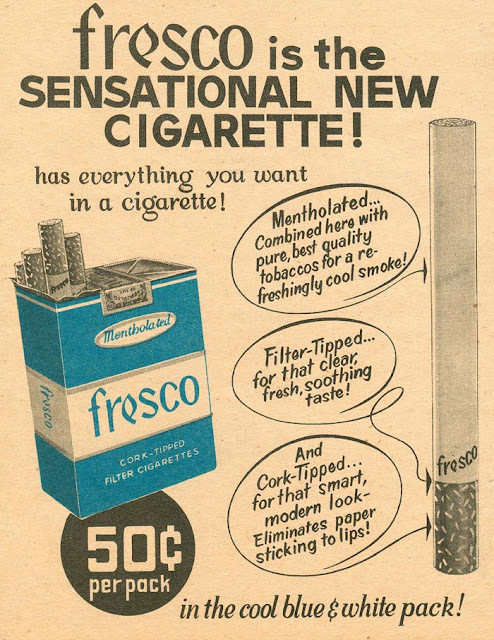 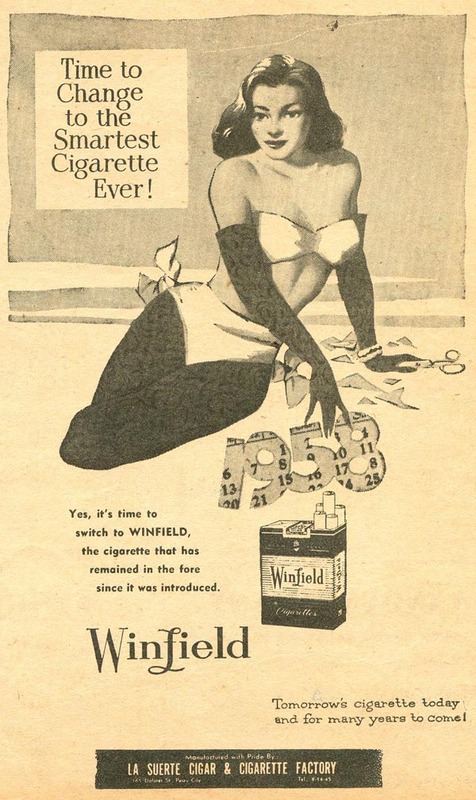 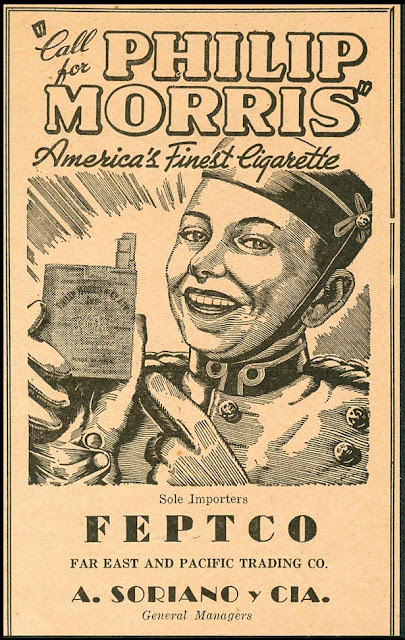 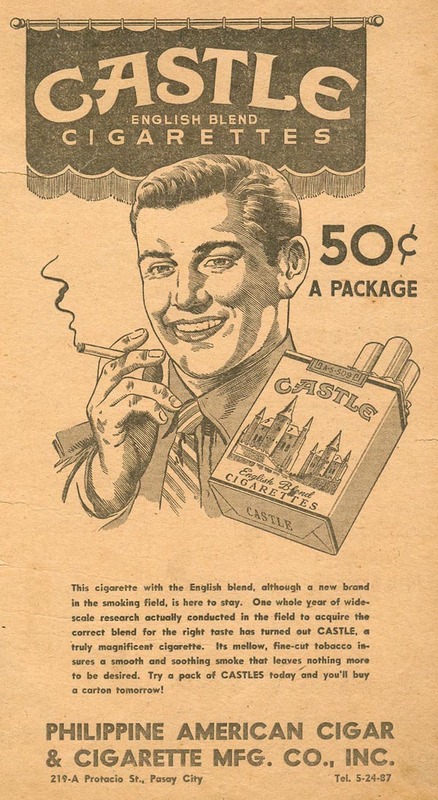 In the first half of the 20th century, tobacco companies were major contributors to the advertising industry, and many magazines and newspapers were sponsored by these companies. 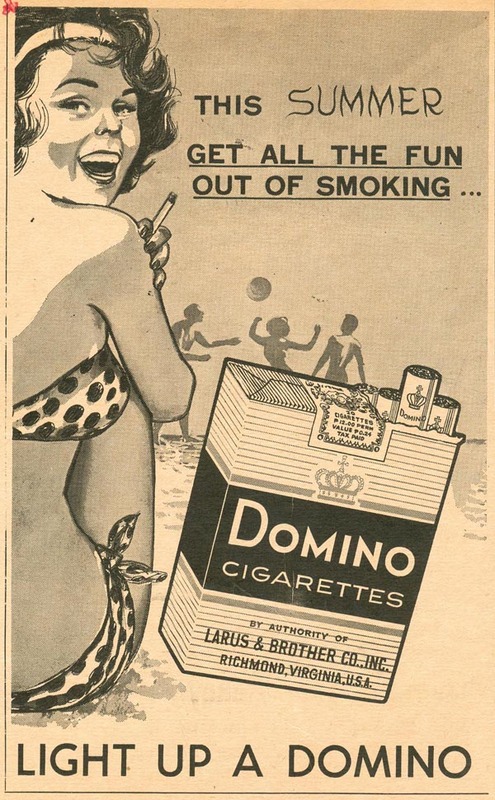 As the 1970s dawned, things were beginning to change. 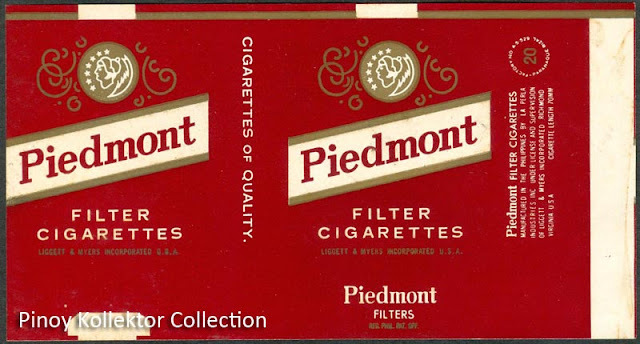 During the mid-70s, people became aware of the health hazards of cigarette smoking and the government required tobacco packaging to carry health warnings. 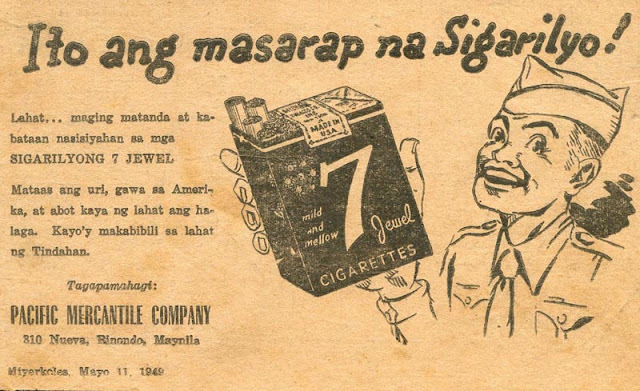 These cigarette advertisements from the 1940s, 1950s & 1960s were a reminder of the past when smoking was still cool and refreshing. 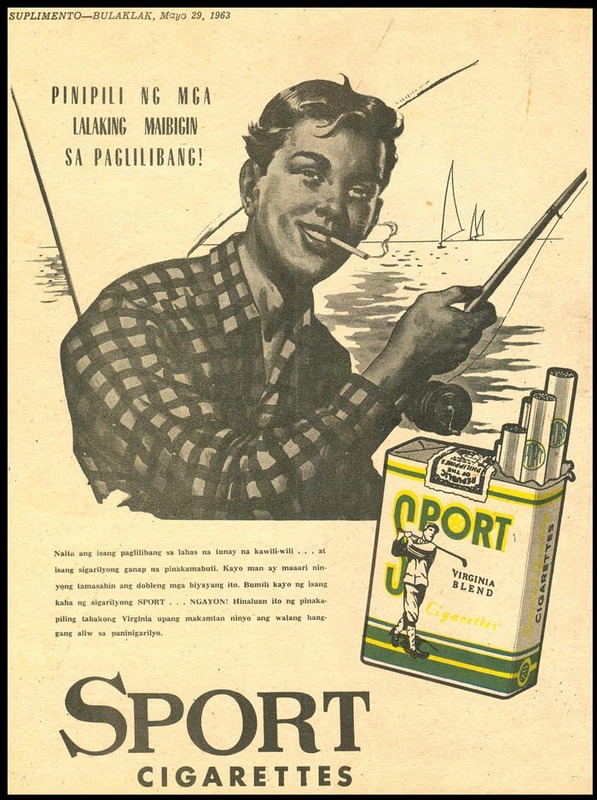 The following advertisements are from the collection of Arch. 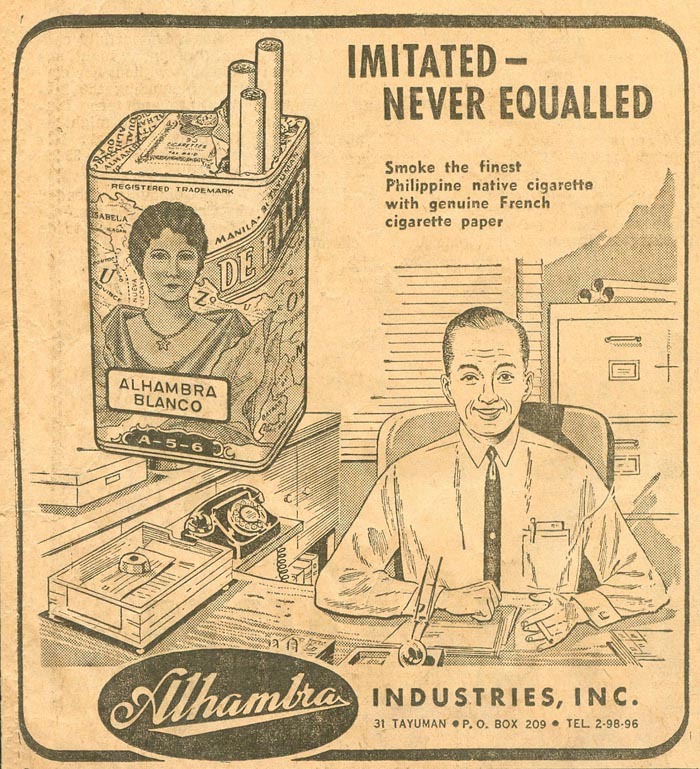 Alex Villaflor, while the cigarette wrappers are from my collection. 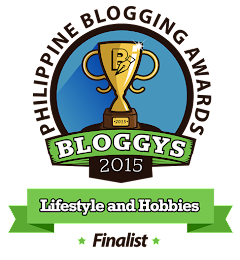 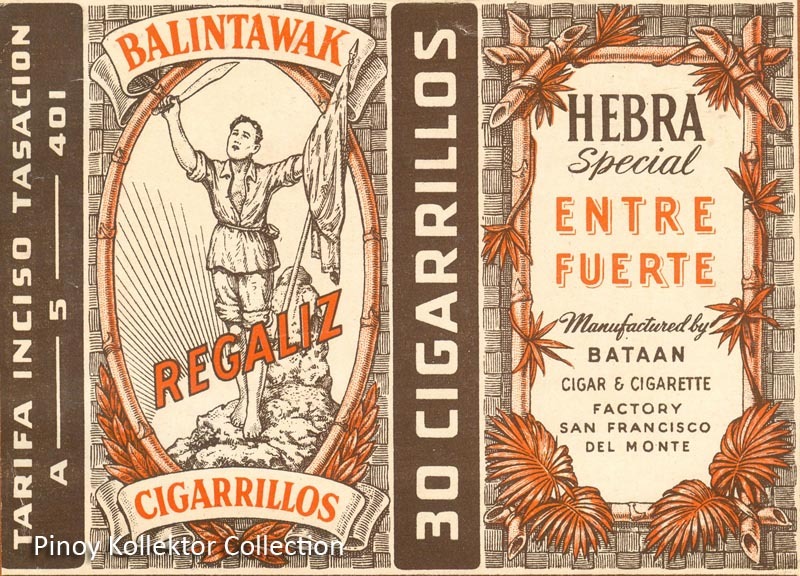 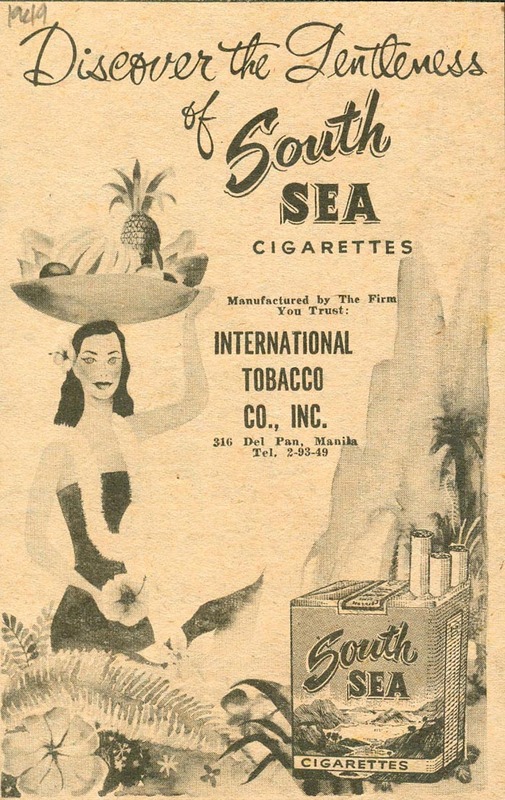 BATAAN Cigar & Cigarette Factory Coupons. You get a free cigarette pack if you are lucky to get one inside. 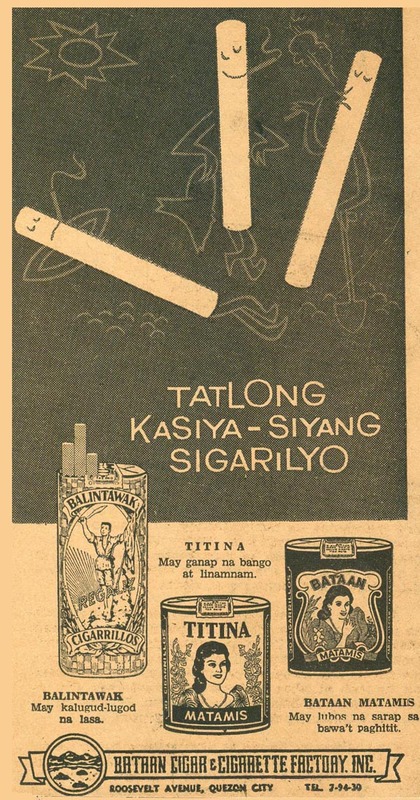 BALINTAWAK cigarette wrapper manufactured by BATAAN Cigar & Cigarette Factory, Inc.
BATAAN REGALIS Cigarette wrapper manufactured by BATAAN Cigar & Cigarette Factory, Inc. 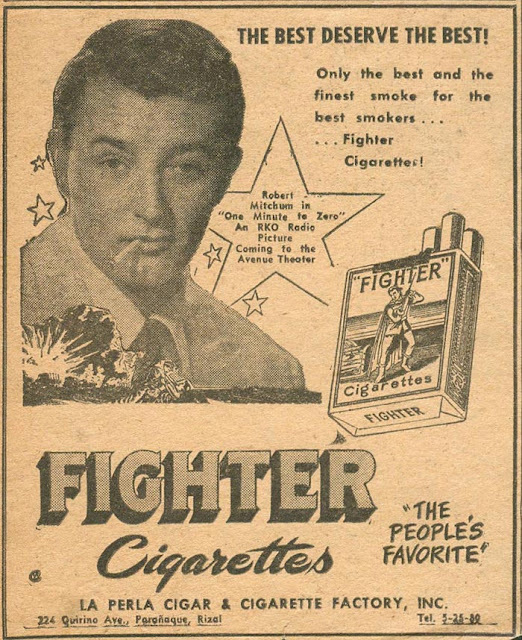 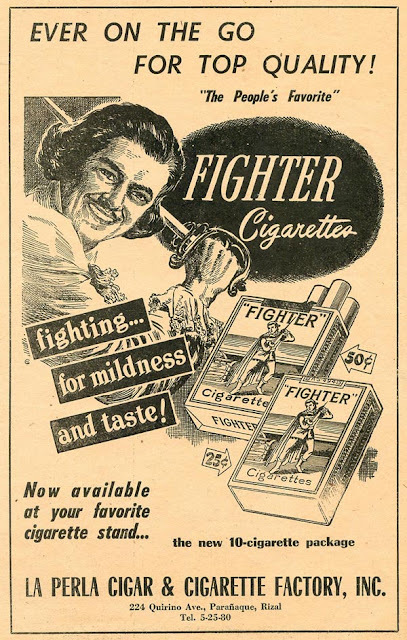 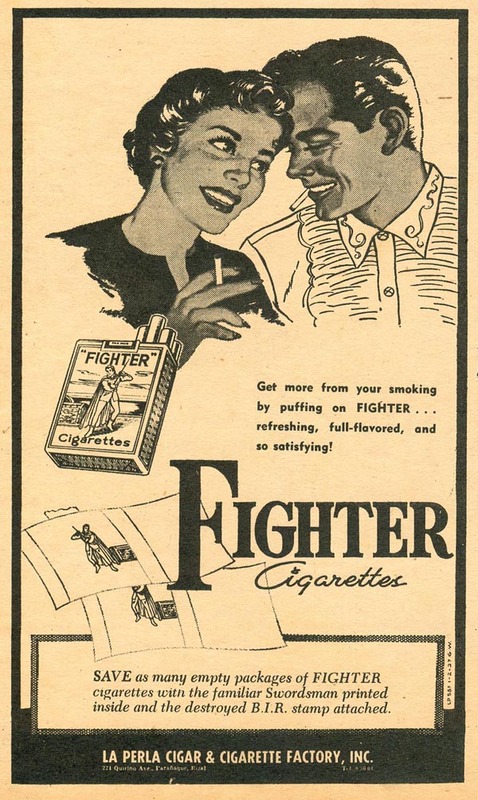 FIGHTER Cigarette manufactured by LA PERLA Cigatr & Cigarette Factory, Inc., Paranaque, Rizal. 7 JEWELS Cigarette distributed by PACIFIC MERCANTILE COMPANY, Binondo, Manila. 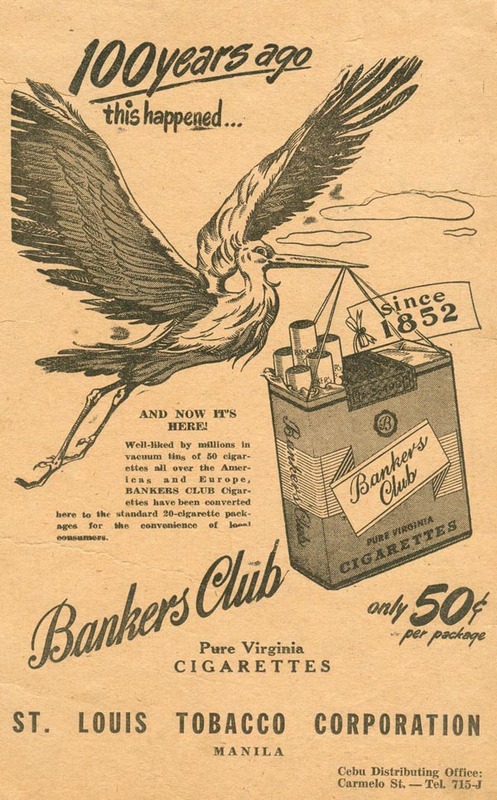 BANKERS CLUB Cigarettes distributed by St. Louis Tobacco Corporation. Carmelo St., Manila. 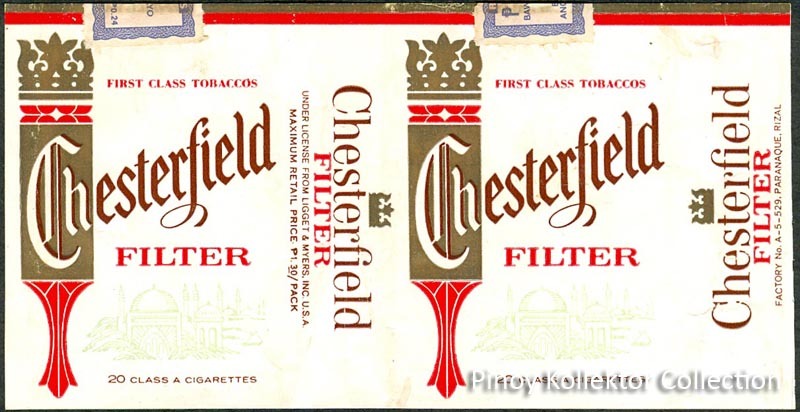 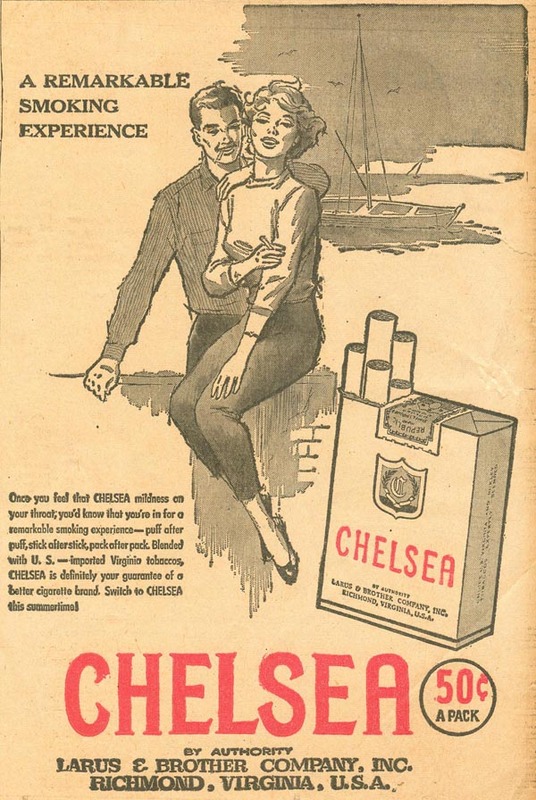 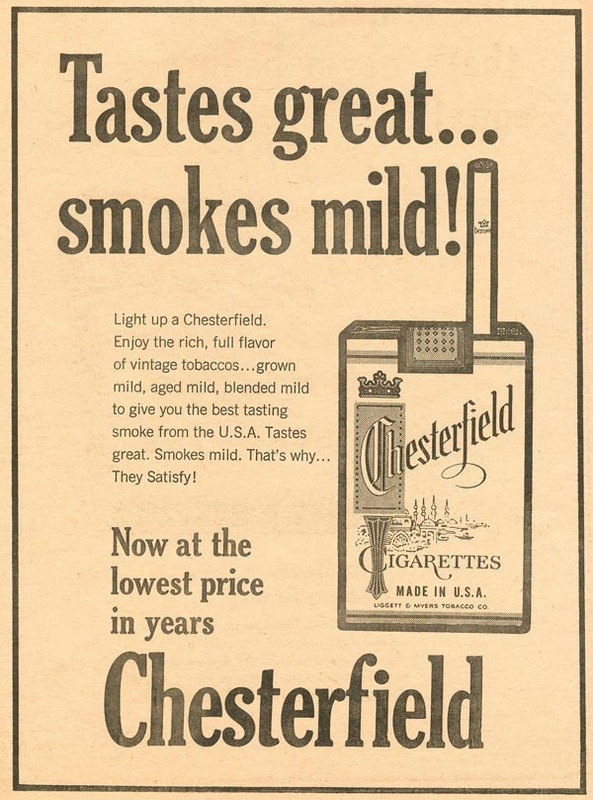 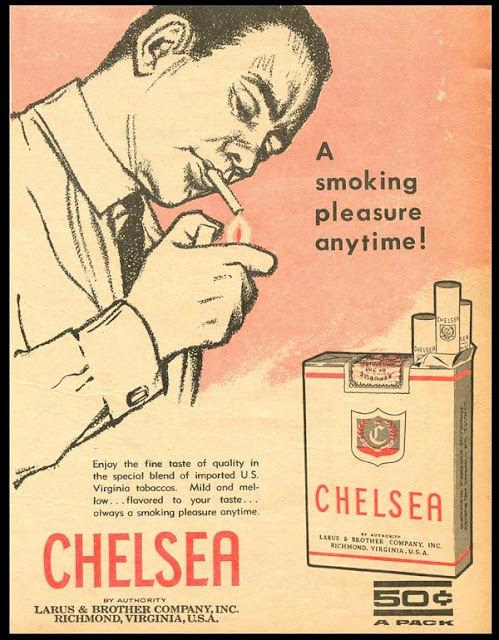 CHELSEA Cigarettes distributed by INTERNATIONAL TOBACCO COMPANY, INC. 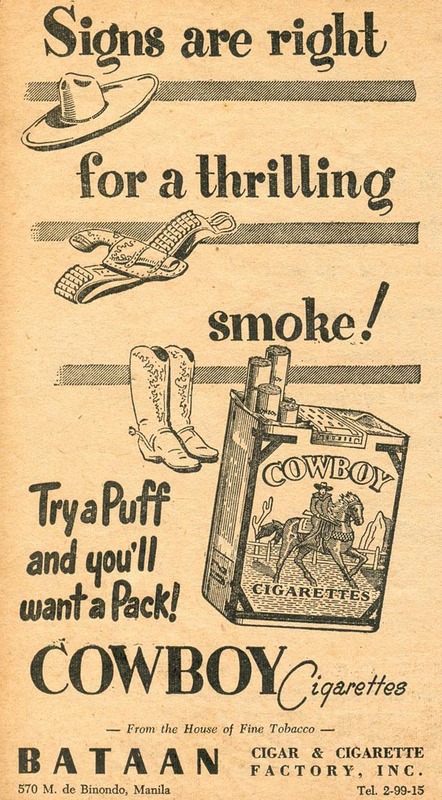 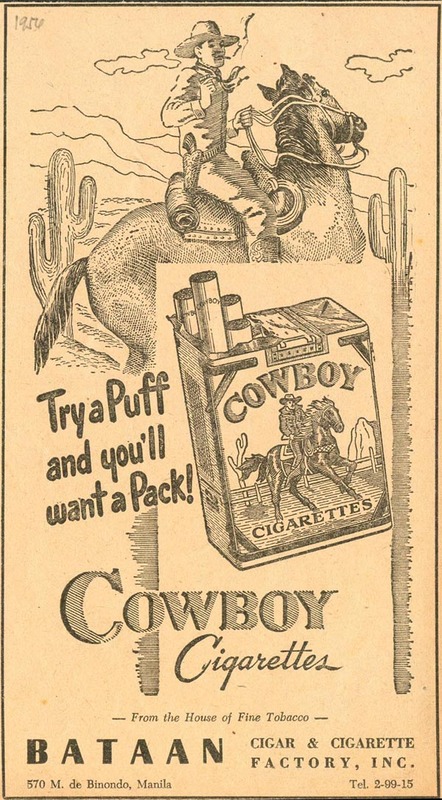 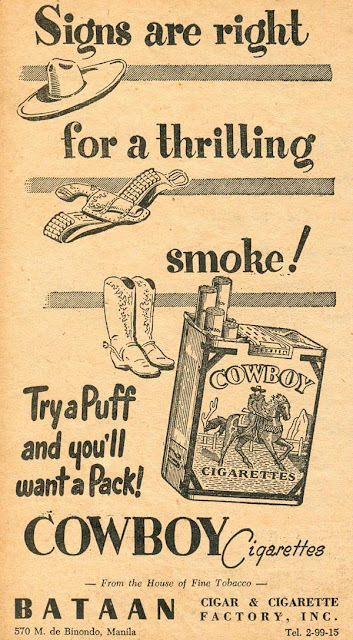 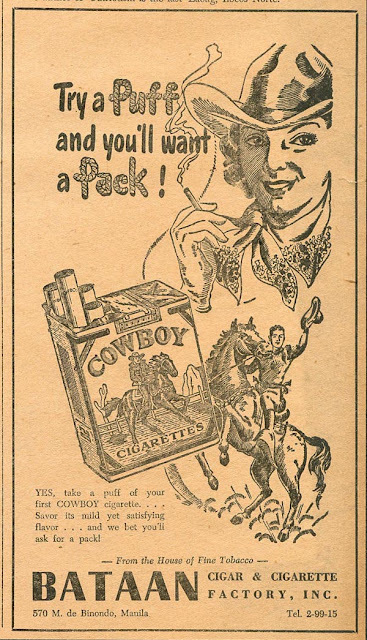 COWBOY Cigarettes manufactured by BATAAN Cigar & Cigarette Factory, Inc., Binondo Manila. 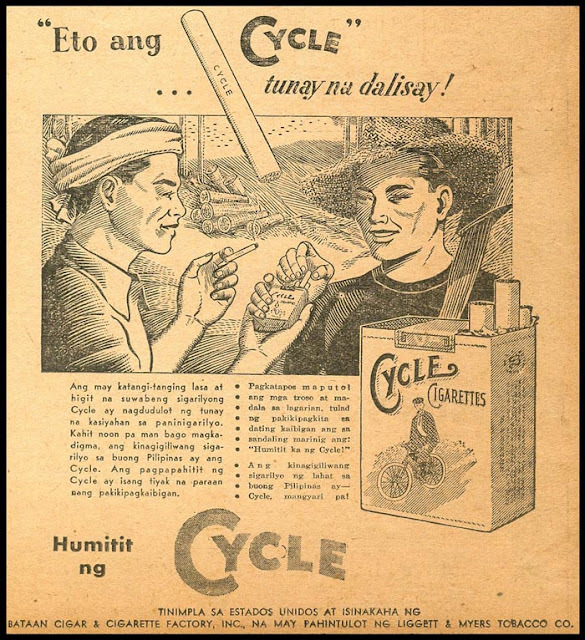 CYCLE Cigarettes manufactured by BATAAN Cigar & Cigarette Factory, Inc., Binondo Manila. 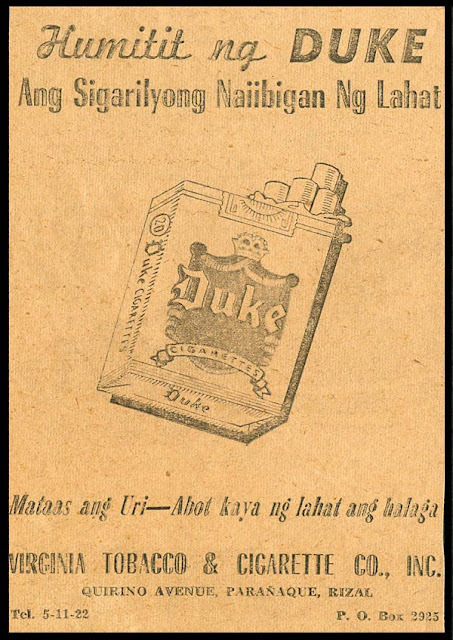 DUKE Cigarettes manufactured by VIRGINIA Tobaco & Cigarette Factory, Paranaque, Rizal. 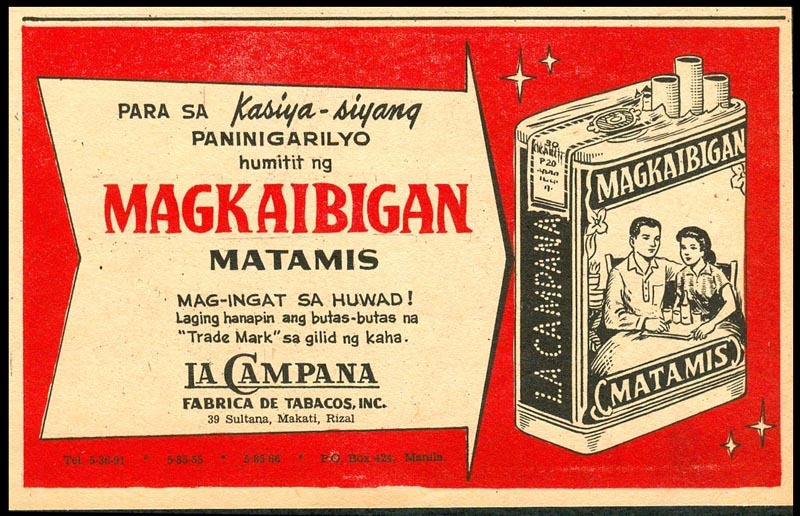 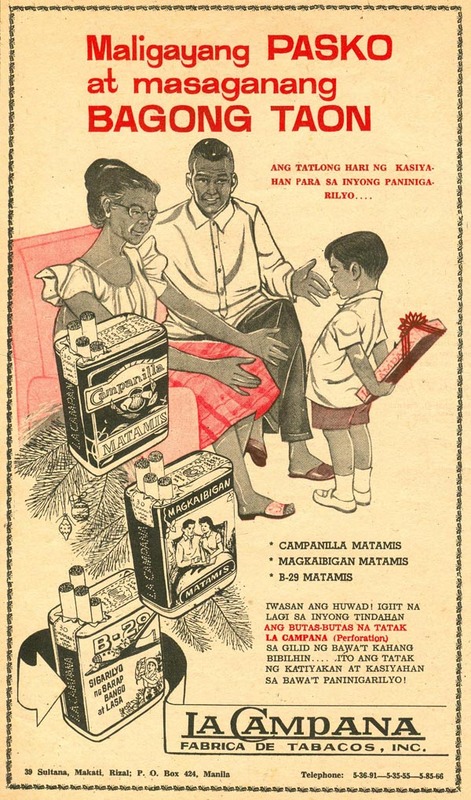 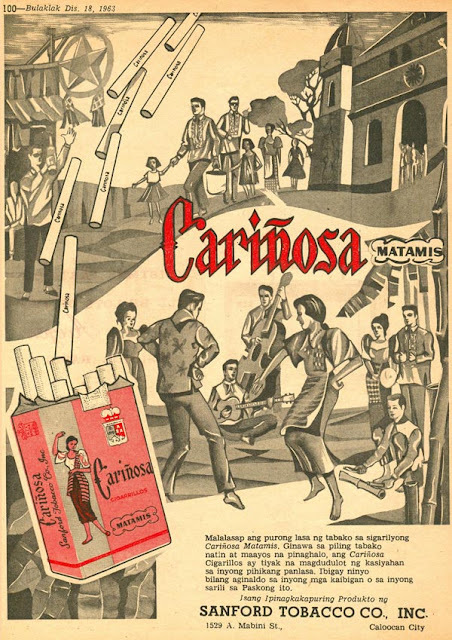 CARINOSA MATAMIS Cigarettes manufactured by SANFORD TOBACCO CO. INC, Caloocan. 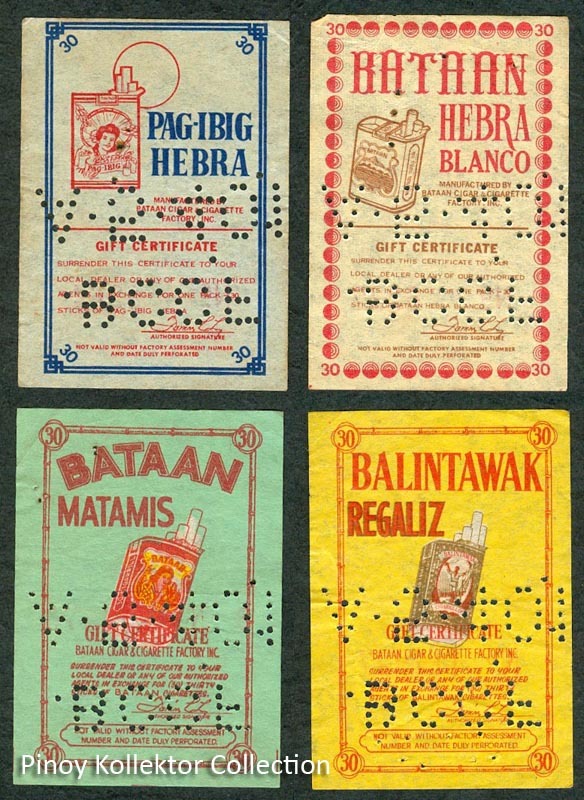 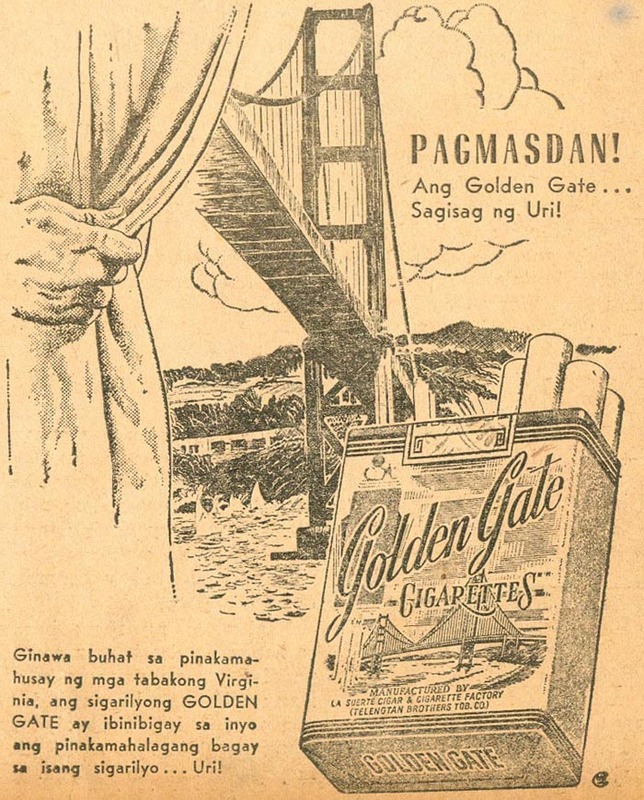 GI Cigarettes manufactured by BATAAN Cigar & Cigarette Factory, Inc., Binondo Manila. 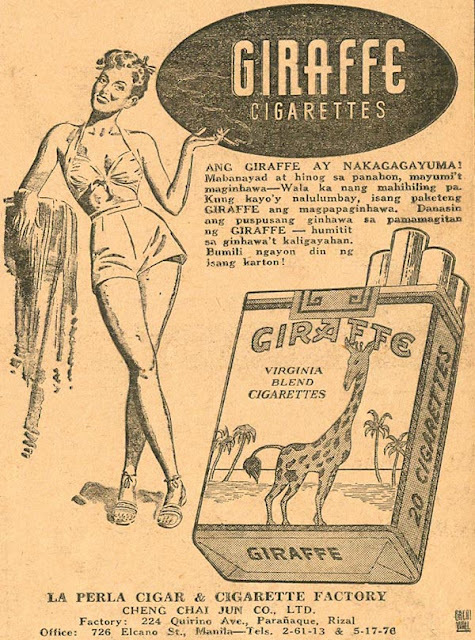 GIRAFFE Cigarettes manufactured by LA PERLA Cigar & Cigarette Factory, Paranaque, Rizal. 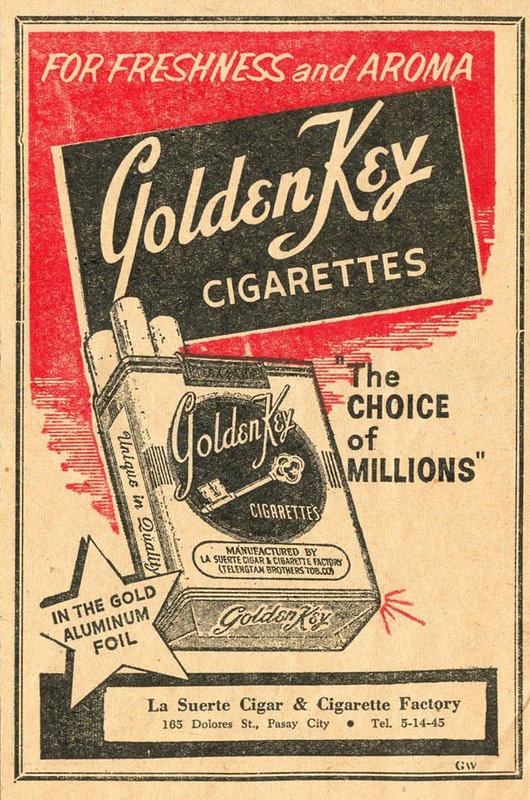 GOLDEN KEY Cigarettes manufactured by LA SUERTE Cigar & Cigarette Factory, Pasay City. 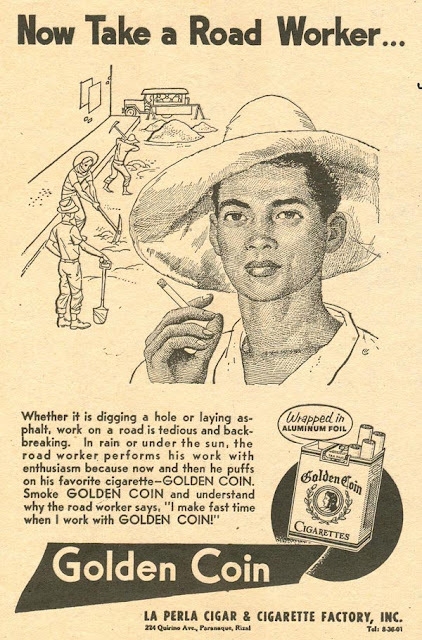 GOLDEN COIN Cigarette manufactured by LA PERLA Cigar & Cigarette Factory, Paranaque, Rizal. 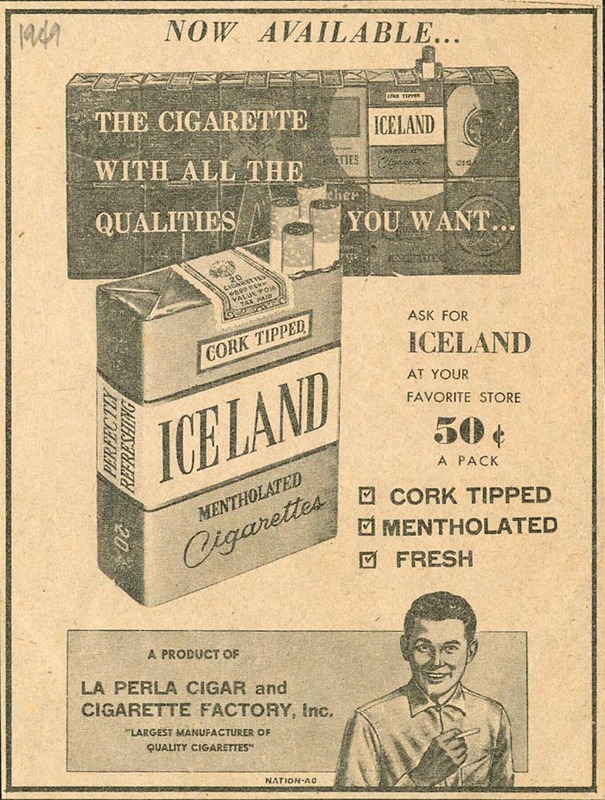 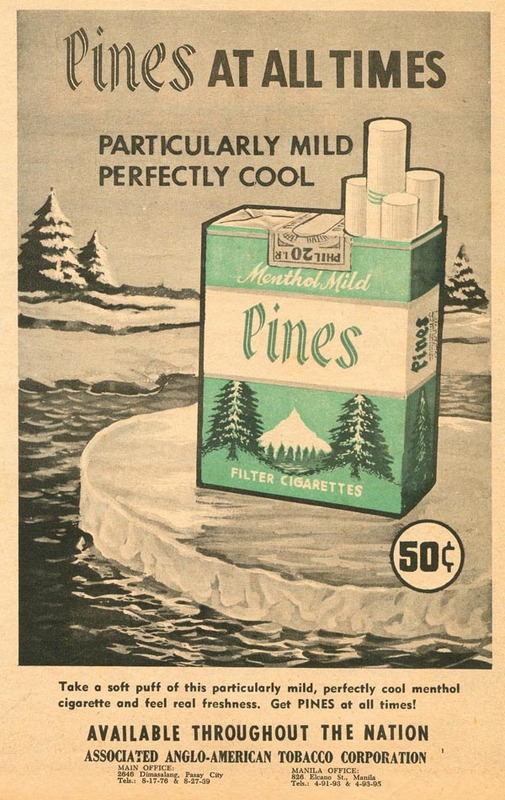 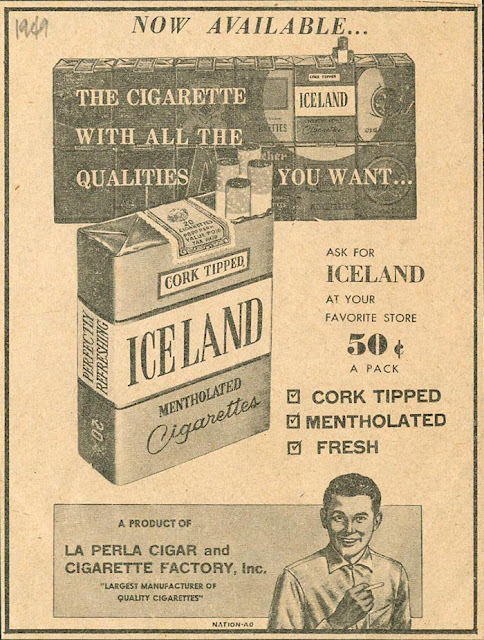 ICE LAND Menthol Cigarettes manufactured by LA PERLA Cigar & Cigarette Factory. 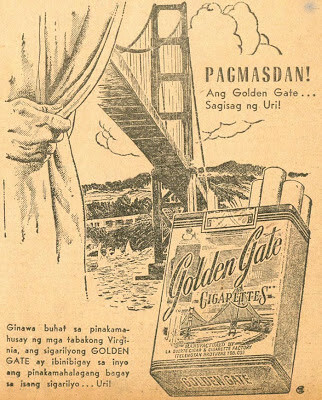 GI Cigarette manufactured by BATAAN Cigar & Cigarette Factory, Inc., Binondo Manila. 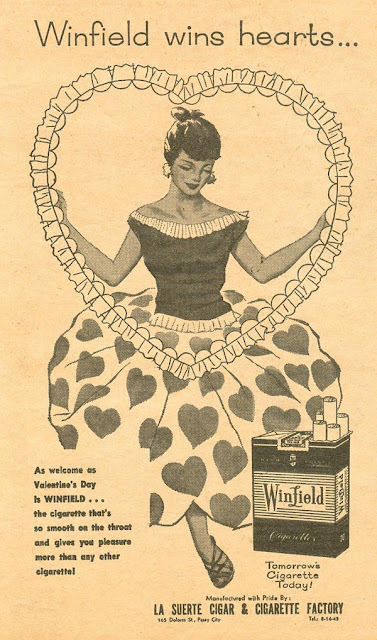 WINFIELD Cigarette manufactured by LA SUERTE Cigar & Cigarette Factory, Manila. 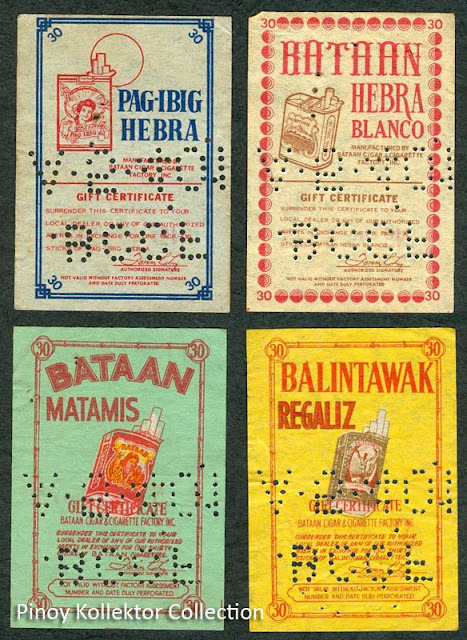 WINNER Cigarettesmanufactured by MABUHAY CIGARETTE MFG. 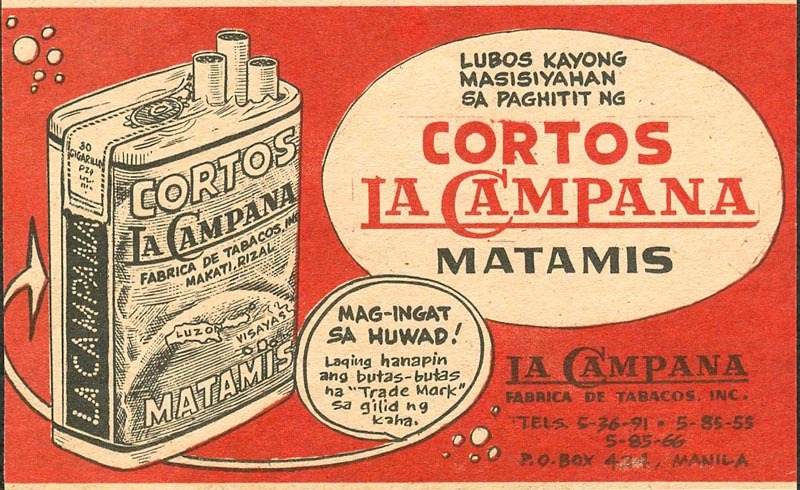 CO., Malabon. 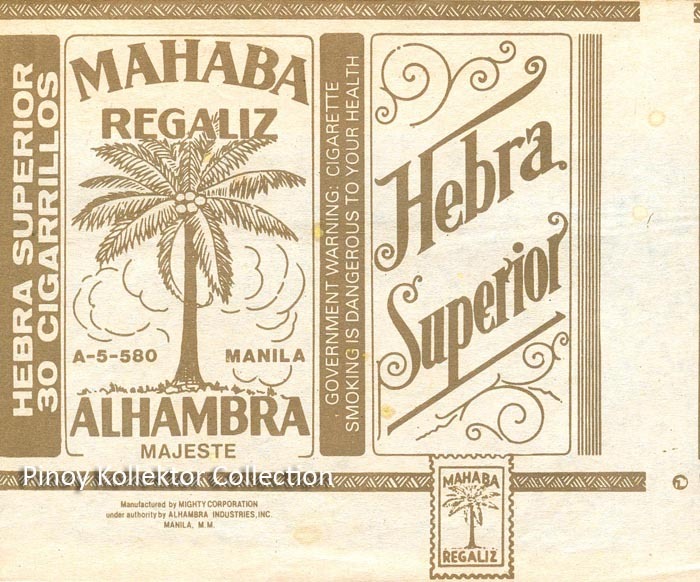 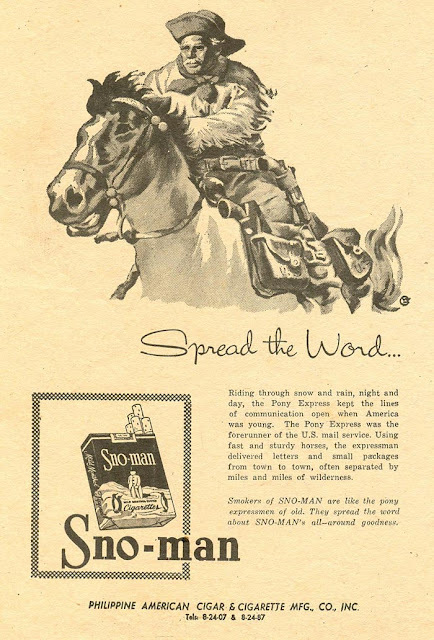 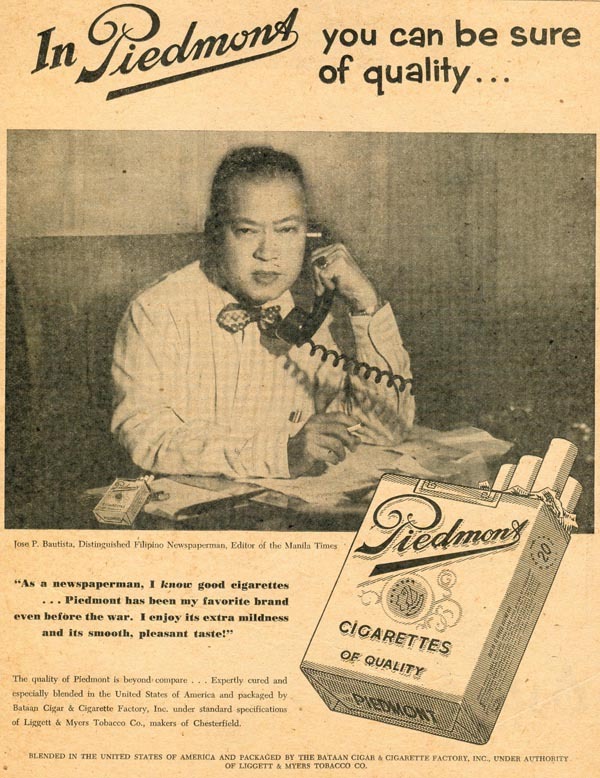 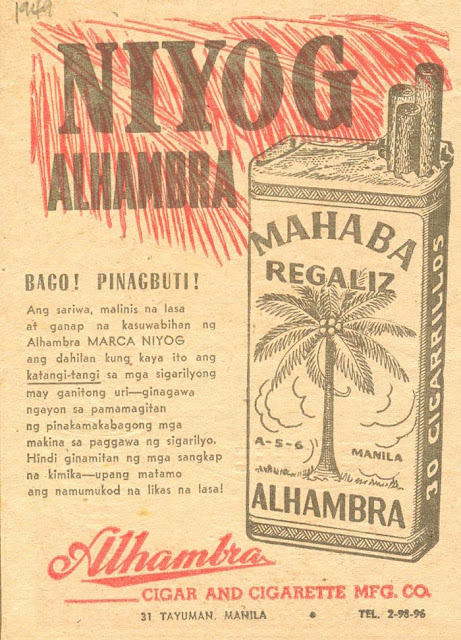 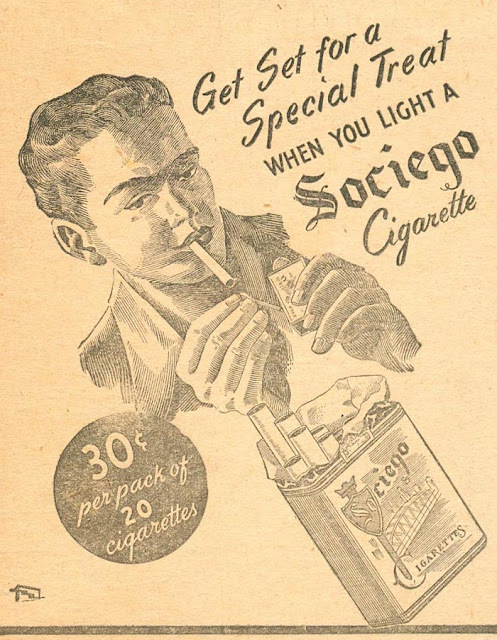 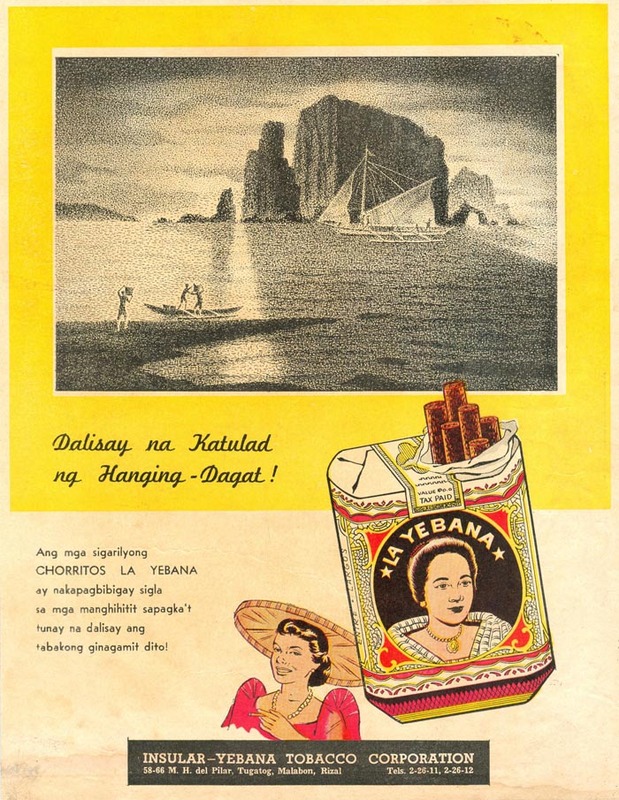 SOUTH SEA Cigarette distributed by INTERNATIONAL TOBACCO COMPANY, INC., Manila.